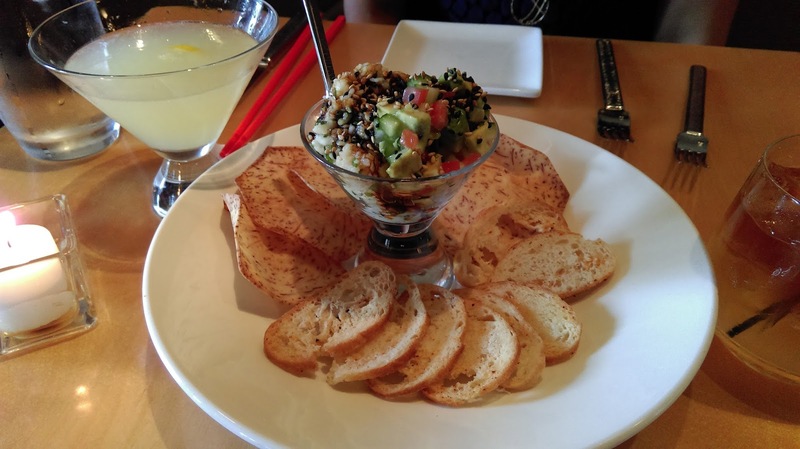 Our first stop for food was Red Ginger. 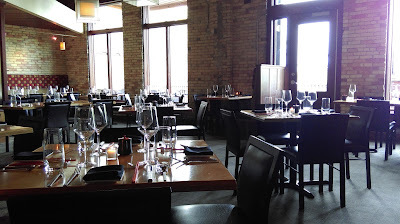 We arrived at 5 p.m., when they begin serving dinner (they do have a happy hour before 5). Since we were there so early, we were quickly seated. Red Ginger serves dishes influenced by the cuisine of a variety of Asian cultures. Since we knew we were going to eat more later, we did not order main courses. We ordered the spicy tuna roll from the sushi menu and two specials, a King Crab roll and ceviche. We also ordered drinks from their cocktail menu, the Dark 'n Stormy for me and the Lotus Flower for my wife. Everything was unbelievably good. Red Ginger's food and drinks tempted us to give up our plans for the night and to stay and order more, but we found the strength to ignore Red Ginger's call and to continue our odyssey. I generally am a wine and beer guy (mostly beer), but I have heard a lot of great things about the numbers of distilleries popping up throughout Michigan. 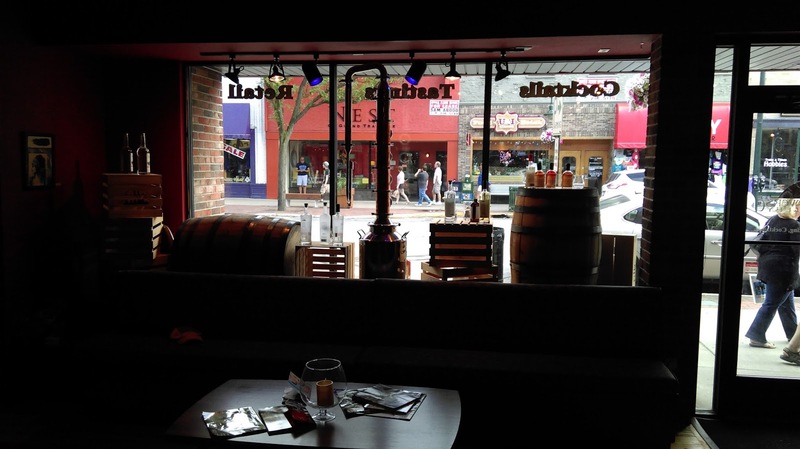 When we walked past Grand Traverse Distillery's tasting room on Fort Street, I had to go inside to see what they have to offer. 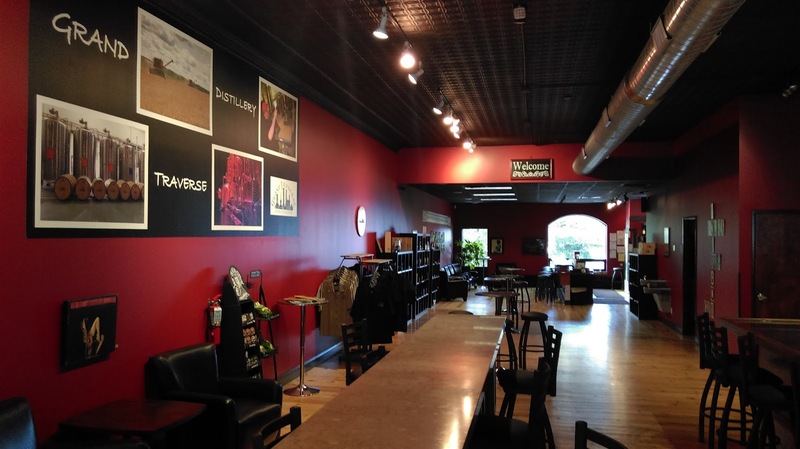 This location is not the actual distillery, which is also in Traverse City but not downtown, Instead, this is one of the distillery's four additional tasting rooms throughout the state. 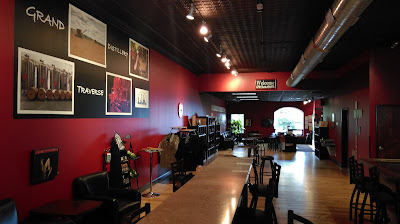 The tasting room sells bottles of their spirits, souvenir glasses, shirts, and hats, and it also allows visitors to taste their spirits for $1 per taste. The bartender asked what I normally drink and suggested the Peninsula Gin. He clearly knew his trade because it was excellent. I also tried the bourbon whiskey, which I also enjoyed, and the True North Vodka, which was my least favorite but still good. My wife tried the two cherry flavored spirits, the True North Cherry Vodka and the Cherry Whiskey. She loved the cherry vodka, so we made sure to pick up a bottle of it and the Peninsula Gin on the way out of town the next afternoon. 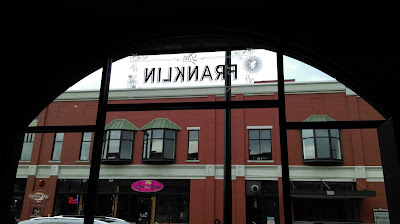 After a little window shopping, we stopped at the Franklin for dinner. 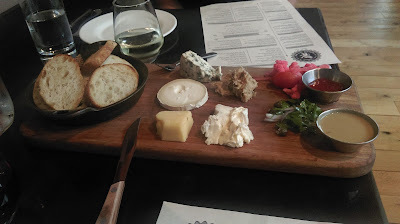 My brother recommended the meat and cheese board, so we ordered four cheeses and the pork belly rillette. The cheese and pork were the highlight of the meal, along with the pickled cauliflower and vegetables that came with the board. The wine list was excellent too, with several wines on tap. We each ordered a local wine that was on tap to go with our dinner. My wife ordered the Franklin Salad and mushroom soup while I ordered the Angus Striploin. We enjoyed our meals while we watched pedestrians taking cover from the pouring rain outside. The rain stopped as we paid our bill, and we, full of good food and wine, moved on to Stage Five. I am a fan of North Peak Brewing Company's beer. I have had their beers in bottles and on tap throughout southeast Michigan. As a fan, I felt that I owed them a visit. The brewpub is a few blocks away from the heart of downtown, but it is worth walking a few extra blocks, plus it helped burn off some of the food we had eaten. Since we were no longer hungry, we just ordered one beer each. I had the Mission Point Porter, and my wife ordered the Siren Amber. Our only disappointment is that they did not serve their black IPA, which is one of our favorites. Regardless, both of our beers were excellent, and we actually came back to North Peak for lunch the next day on our way out of town. Returning for lunch also allowed me to pick up a growler of their porter to bring home. 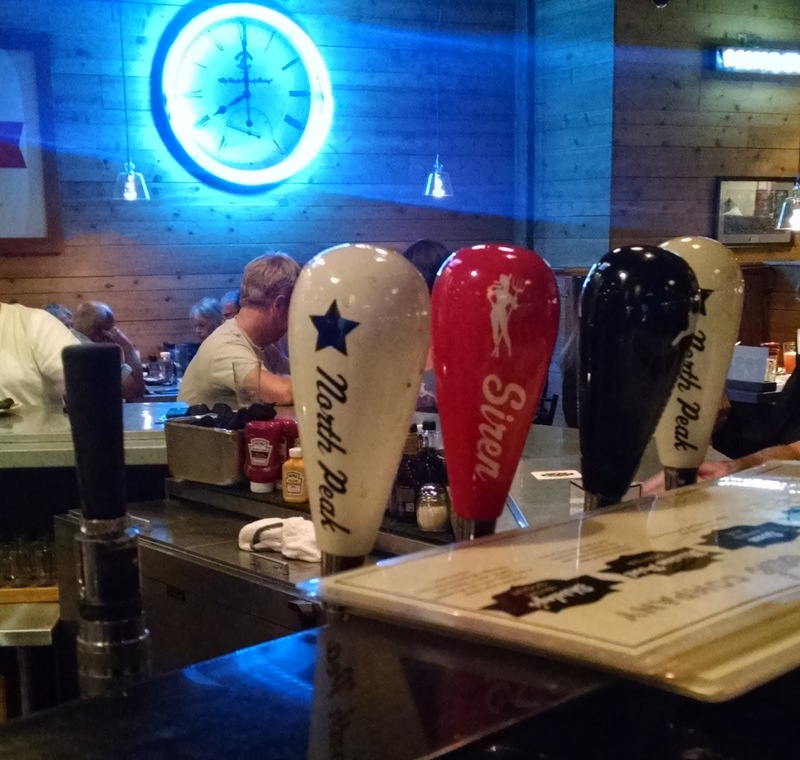 A friend of ours who lives in Traverse City recommended Low Bar as a cool place to get a drink. 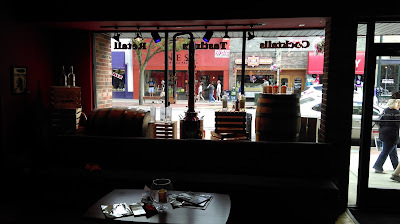 The bar is in the basement of a building on Union Street. 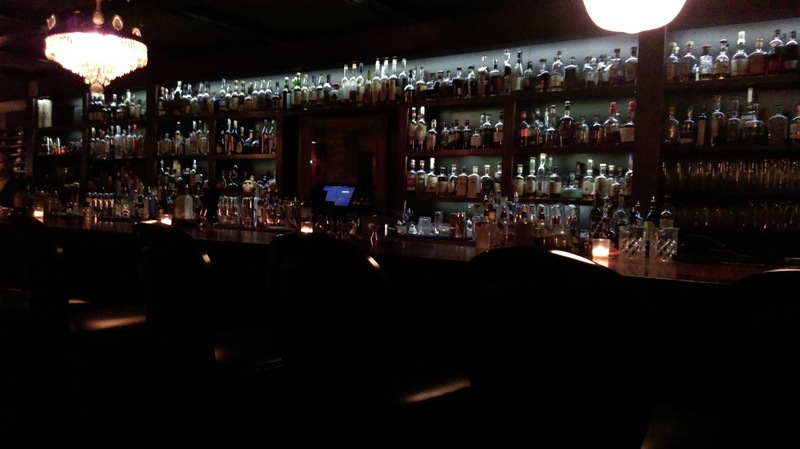 An elevator took us down to a dimly lit hallway that led us to the dark yet inviting bar. 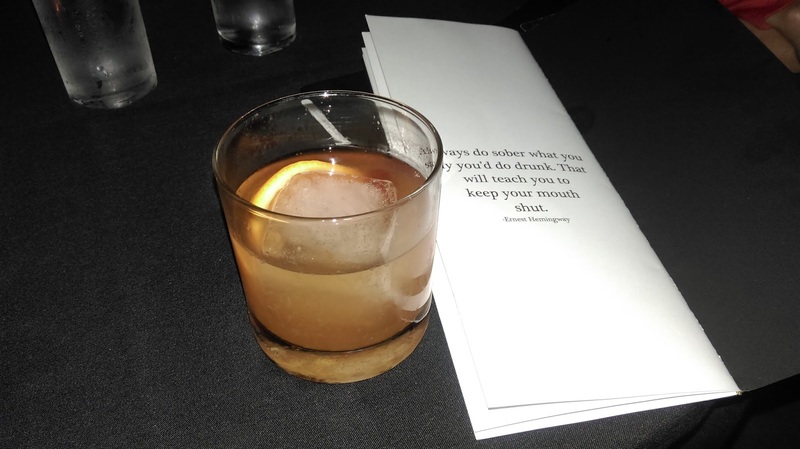 A sign upstairs proclaimed that they have an award-winning old fashioned, so I ordered one and agreed that it was award worthy after my first sip. My wife tried the aviation, which she raved about. The bar was a little less than half full, but it was quiet. There was no ear-piercing music to stifle a conversation, so I highly recommend Low Bar to anyone who believes that conversation over good drinks is not a lost art form. Before we left, I ordered the Hemingway to pay homage to a man who loved alcohol and Northern Michigan. Nothing caps a summer night like good ice cream, and Milk and Honey delivered. They use organic products from local farms to make their ice cream and other treats. I ordered the Almond Joyous ice cream in a waffle cone and happily devoured it while walking back to the hotel. 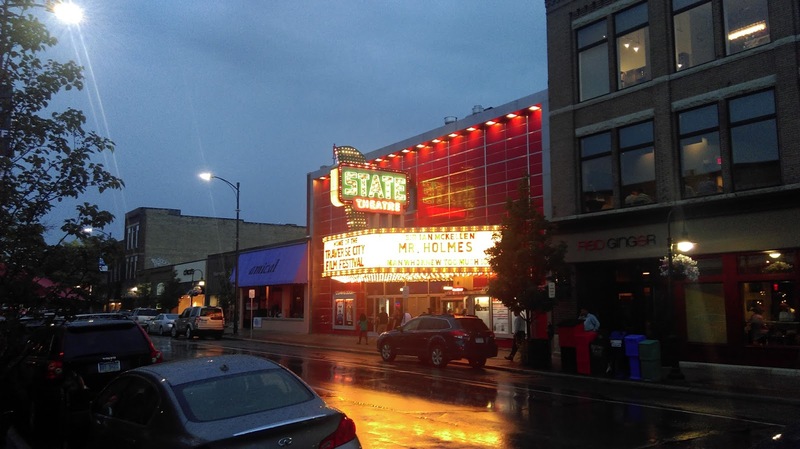 I survived the Tour de Traverse City and fell in love with Traverse City in one night. 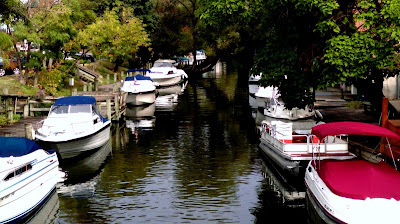 I look forward to visiting again soon, and I know that my next Tour de Traverse City will be longer than one day.